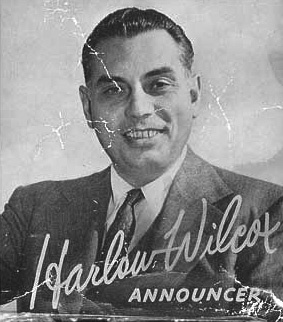 Harlow Wilcox left a successful career in electrical equipment sales to become one of the most successful announcers and pitchmen in radio, beginning as a staff announcer at CBS and later NBC in Chicago. When the Johnson Wax Program with Fibber McGee and Molly replaced the House by the Side of the Road program, Wilcox moved to the new show along with the musical components. Wilcox became a recurring character in the stories, as well as the announcer/pitchman. In this guise he was able to work his plug for the sponsor into the story rather than interrupt the flow. Indeed, it is thanks to writer Don Quinn's philosophy of "kid the pitch, not the product" that Wilcox's middle commercial became one of the memorable elements of the show. Wilcox was with the show from the very first broadcast through the end of the half hour programs in 1953. Harlow Wilcox was also the announcer for Amos and Andy, Suspense, Truth or Consequences, and several other projects. Enjoy over 1100 episodes of Fibber McGee & Molly on MP3 CD available from Old Time Radio.